Recently, my sister decided that she would transition to natural hair. She was struggling with breakage and finally said enough is enough. She also longed for the versatility of natural hair: curls in the summer and blown-out styles in the winter. So she embarked on her transition. She’s about nine months in and plans to transition for about a year and a half. [I was a short-term transitioner with only a 5 1/2 month transition.] The challenges she faces during her transition, brings back memories from when I transitioned four years ago. Read Shanutrice’s Hairstory. She transitioned for almost 3 years. You can read it here. 1. Finish Your Old Products – I know. It seems like every blog is pushing every new product that comes out on the market. But before you join the bandwagons and become a product junkie, use up your old product first. Refraining from becoming a product junkie will force you to focus on your hair regimen –which is most important. 2. Introduce New Products One at A Time – As you finish your old products, try introducing new products when transitioning from relaxed to natural hair one at at time. If you only introduce one new product, you will have a “controlled” experiment. You’ll quickly be able to determine which products are or aren’t’ working for your hair. 3. Pay Special Attention to the Line of Demarcation – The line of demarcation is where your relaxed hair and natural hair meet. Since your hair textures will differ greatly, this will be a weak point in your hair. So take extra care to reduce breakage when transitioning from relaxed to natural hair. Otherwise, you will have some random short hairs during your transition. 4. Don’t Try to Guess Your Curl Pattern – It’s tempting, but don’t do it. You will not be able to see your true curl pattern until you cut off your relaxed ends, so save yourself from the guessing game. Besides, the natural hair community can be pretty consumed by the concept of curl pattern. Don’t get caught up in that just yet… just enjoy the transition. By the time you big chop, you will have mastered these styles. Besides, if you constantly straighten your hair, you run the risk of damaging your kinks and curls. Which will only lengthen the transitioning from relaxed to natural hair. This site, Natural Hair Rules has tons of natural hairstyle tutorials. You can see them here. 7. Keep Your Scalp Clean – The key to hair growth is a clean and healthy scalp. Remember, how your mom used to grease your scalp with grease? Well, forget that. Unless you want to clog your hair follicle. Since your scalp creates a natural hair sebum, its not necessary. But if you like to, you can massage your scalp with castor oil or a light oil such as Jojoba Oil, but avoid mineral oil. Wash your scalp and hair whenever you see buildup, since that buildup will stunt your hair growth. 8. Trim Your Ends – Contrary to popular belief trimming your ends won’t make your hair grow faster. But it will prevent excessive breakage. This is especially important during the transition. On a regular basis, trim off split ends. Since you don’t plan on keeping the relaxed ends anyway, this is a great opportunity to trim away at those ends. You can trim as often as every 6 weeks or 3 months until you’re completely natural. 9. Protect Your Hair Strands – Do your best to protect your hair. Don’t over-manipulate your hair. Deep condition. Utilize protective styles — as long as they are not too tight or left in too long. Since your hair is fragile right now, it is especially important to protect it from damage. If your goal is length retention, then you might as well practice now since this is key. 10. You’ll Know When It’s Time to Big Chop – One of the top questions asked is when will you know it’s time to big chop. Trust me. You’ll know. You will reach a point when you’re tired of dealing with two textures. Or you will be anxious to see your natural hair in all it’s glory. On the spur of the moment, I called my hair stylist when I was leaving work. She squeezed me in and chopped it off. I never looked back. So there you have it… the ten best tips for transitioners! 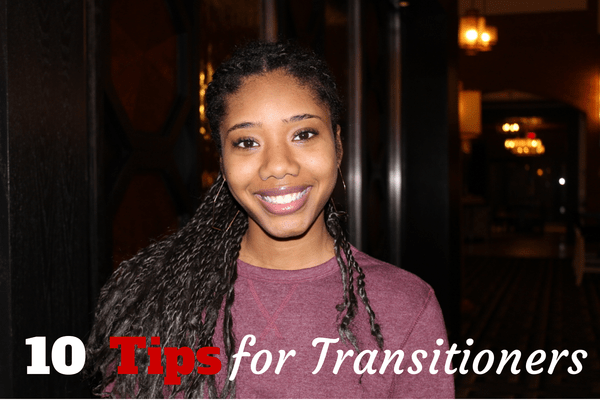 Do you have any additional tips for transitioners? Thanks for the tips. I am currently 1 year in to my natural journey after I did the big chop a year ago for the 8th time. I love it! However, now my 13 year old daughter has decided to transition to natural after having relaxed hair for almost 9 years. She has been transitioning for 6 months now and I am noticing breakage. I am also starting to panic that we are making mistakes, I do not want to damage her hair and she does not want to do the big chop. Which I completely understand for her age. Her hair was shoulder blade length. Keep us in prayer as we transition…..